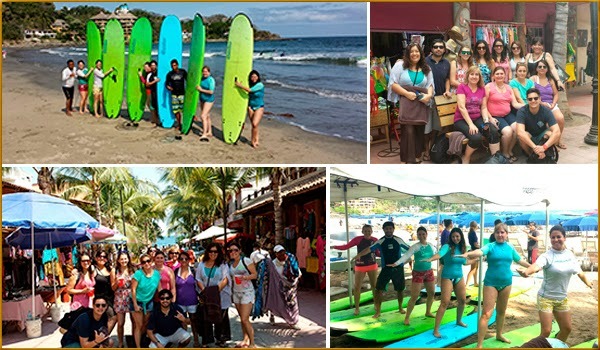 A group of 12 travel agents from Chile visited the Riviera Nayarit and Puerto Vallarta from May 7-11; a second group, this time from Argentina, will arrive on the 19th and stay through the 24th of May. Travel agents from Chile and Argentina are next on the agenda as part of the Riviera Nayarit Convention and Visitors Bureau and the Puerto Vallarta Tourism Trust’s (Fidetur) continuous promotional work in these emerging South American markets. The purpose of the visits was to allow the agents to fully experience the top attractions in each of the destinations in order to enhance their sales tools. They were provided with content and information that highlighted the best of a region that offers a rich variety of options for every taste. A group of 12 Chilean travel agents visited the destinations from May 7-11. Their first stop was in the Riviera Nayarit, where they took a surfing lesson in Sayulita during the SUP and Paddleboard World Championship and were suitably impressed with the amount of activity on the beach. Luxury is another top attraction that must be showcased, so a visit to Punta Mita was de rigueur, followed by a visit to Bucerías that provided a charming counterpoint. There they walked along the streets and immersed themselves in the color and flavor of a small Mexican village, a feeling they continued to enjoy during their visit to Puerto Vallarta. And now, it’s Argentina’s turn! Eleven travel agents from Argentina will be flying in from May 19-24; they will begin their tour by sampling Puerto Vallarta’s culture, traditions, adventure tours and hotel infrastructure. The second part of their trip will continue with more ecotourism adventurse in Higuera Blanca, El Anclote and, of course, the Islas Marietas, an icon of the Riviera Nayarit. Other “must-sees” for the FAM group include San Pancho and Sayulita, as they have positioned themselves as some of the destination’s signature microdestinations, thanks to their cultural riches and cosmopolitan tendencies. Both groups will also perform hotel site inspections at the two destinations, as this infrastructure is top-notch and one of the major draws for visitors.